February Renal Path Video - Wash U Nephrology Web Episodes! For anyone wanting to unravel an unusual case and brush up on their renal pathology, check out the February episode of the Wash U Nephrology web series. I recently presented the case of a middle-aged patient with ESRD secondary to Goodpasture syndrome. She presented with AKI 3 months after a kidney transplant. Her creatinine had normalized to 0.9mg/dl post-transplant. However, over the next few months she had multiple hospitalizations for infections, perinephric fluid collections and three episodes of AKI. Her creatinine finally stabilized at 1.5mg/dl. Due to concerns that she was overly immunosuppressed, her mycophenolate was discontinued during her last admission and her prednisone was stopped per weaning protocol. She was continued on tacrolimus. At her post-discharge follow up, she was found to have recurrent AKI with Cr 2 mg/dl She had 1+ blood on UA, but no proteinuria. GBM antibody was negative. She was admitted for a transplant kidney biopsy. The biopsy demonstrated diffuse linear staining of the glomerular basement membrane. There was no evidence of active glomerulitis or crescent formation. Mild mesangial expansion and moderate thickening of the GBM were noted with no signs of cell-mediated or antibody-mediated rejection. This prompted the million dollar question: Is this diffuse GBM staining early recurrence of anti-GBM disease or something else? The inciting event of anti-GBM disease is still unknown (correlations with smoking, cocaine use, solvent exposure, and infections), however the pathophysiology is fairly well established - an insult causes a conformational change of the type IV collagen network in the GBM resulting in exposure of the non-collagenous portion of the alpha-3 chain which elicits an immune response. Based on multiple uncontrolled studies, these patients can be transplanted 6-12 months after their GBM antibody titers become negative and they have similar transplant outcomes when compared to other causes of ESRD. But how often does it recur after transplant? In 2013, Tang et al retrospectively analyzed 58,000 patients in Australia and New Zealand started on RRT and found 449 diagnosed with anti-GBM disease, 224 of whom were transplanted. Of those transplanted, 2.7% developed biopsy proven recurrence. So... it recurs, but rarely. What about a false negative GBM antibody titer? Our patient's titer was negative, and the reported false negative rate for the ELISA and western blot is 2-3% making it unlikely. However, there have been case reports of anti-GBM disease with negative ELISA and weakly positive western blot suggesting low or transient antibody production. In addition, alternative immunoglobulins not picked up by the ELISA, such as IgG4, and alternative GBM antigens have been proposed based on case reports. What else could produce diffuse GBM staining? In monoclonal immunoglobulin deposition disease the physicochemical properties of the monotypic light chains result in high affinity for the GBM and diffuse linear staining. In addition, in diabetic glomerulopathy, there is thought to be a loss of negative charge in the GBM which allows negatively charged species such as immunoglobulin and albumin to collect in and expand the GBM. Our patients SPEP and SFLC were normal, and the donor didn't have a known history of DM. 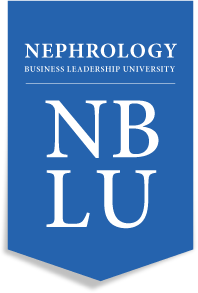 NBLU is a unique week long program that brings together a diverse faculty of practicing Nephrologists, hospital and dialysis provider executives, and other healthcare professionals who will share their insights on leadership, the business of nephrology, and the evolving healthcare landscape. Most sessions are held in a workshop format and are highly interactive and individualized. NBLU will hold its second annual program from August 7th to August 11,2017 in Plano, Texas. Since we would like to keep the sessions very interactive space is limited. Travel support, hotel accommodations, and most meals are provided to all fellows that are attending. 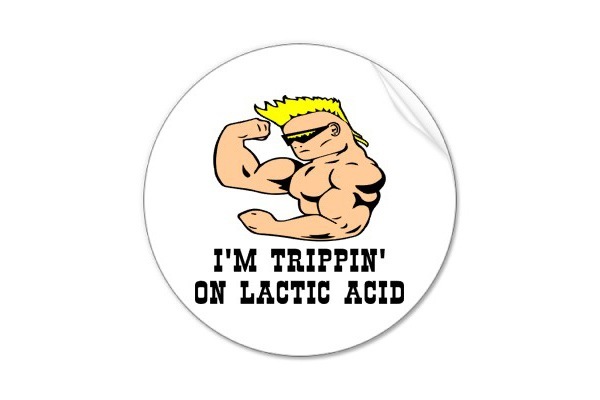 There should be little to no out of pocket expenses to the fellow or their training program. A 62 year old man with ischemic cardiomyopathy (EF 35%) and CKD (baseline Cr ~3 mg/dl) had a witnessed out-of-hospital cardiac arrest. EMS arrived within 3 minutes. He received CPR and was shocked out of ventricular fibrillation (VF). He was intubated and therapeutic hypothermia was initiated in the field. He was admitted to the CCU, where therapeutic hypothermia was continued for 24 hours. 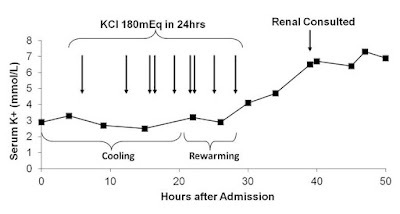 He received aggressive KCl repletion for hypokalemia (see graph below) and supraventricular arrhythmias. On the second hospital day the patient was rewarmed, developed severe DIC (INR 10), worsening shock requiring 3 pressors, and renal was consulted for hyperkalemia and oliguric AKI on CKD. 2) catecholamine-induced shift of KCl into cells. Interestingly, the latter seems to depend on the type of protocol used to induce hypothermia. Core cooling increases norephinephrine but not epinephrine, and therefore does not cause a shift of K into cells. In contrast, external cooling (which was used in this case, with the application of cooling pads) increases epinephrine disproportionately to norepinephrine. The B2 agonist actions of epinephrine cause a shift of K into cells. 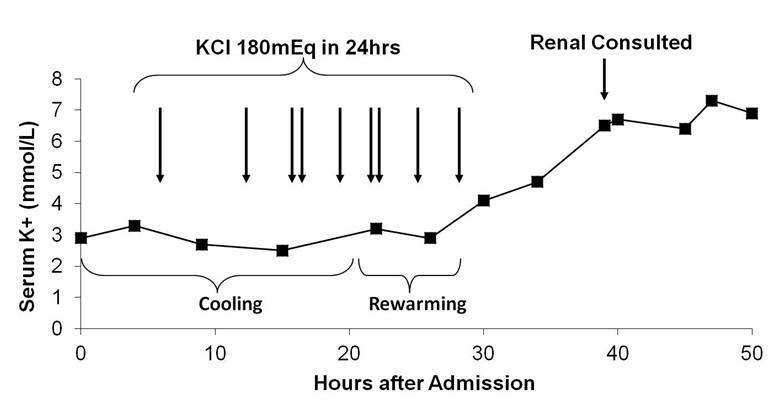 It is therefore critically important to avoid KCl repletion during rewarming due to the risk of rebound hyperkalemia, particularly in oliguric patients such as this one who are unable to deal with the excess potassium load once it moves back out of the cells during rewarming. Wash U Web Episode - Kidney Pathology 101, "Welcome to 2017 Edition"
Happy New Year to all RFN visitors! 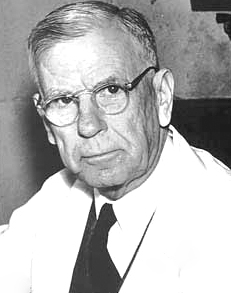 This month's nephrology web episode coming from Washington University is a primer on kidney histology. Most of us can recognize the silver stain from the trichrome, but how many times have we looked at the H and E stain and confused it with the PAS? Unfortunately, I have been guilty of this myself during many biopsy conferences.